Last Updated: October 12, 2018 · Published: September 24, 2018 By: Asian Caucasian 6 Comments This post may contain affiliate links or sponsored content. Let’s make things perfectly clear, I do not follow a gluten-free diet. But, sometimes I enjoy cooking with gluten-free products because I have family members that must adhere to a strict gluten-free diet. 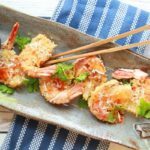 That said, these super tasty Gluten-Free Baked Coconut Shrimp will have you doing cartwheels at the dinner table! No lie, they are that good! I cannot tell you how easy they are to make. If you haven’t mastered the art of butterflying a shrimp, ask your fish monger to do it for you, but no need because butterflying shrimp is a cinch. Seriously! The dredge of the coconut flakes, gluten-free flour and breadcrumbs provide the crispiness to this dish. They bake so quickly and beautifully. Look for the pink curl and the golden brown finish. Done in just 10 minutes! 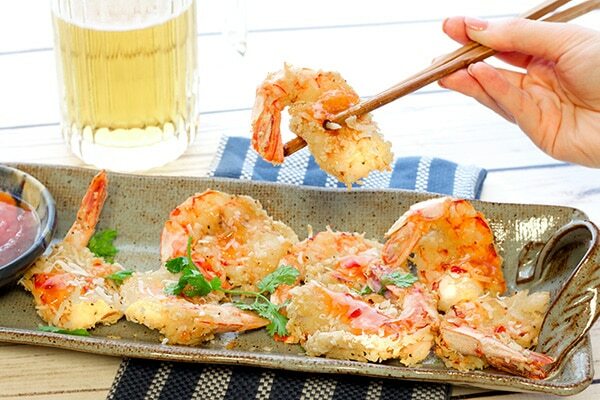 Serve with a sweet chili dipping sauce for the most perfect crowd-pleasing appetizer! 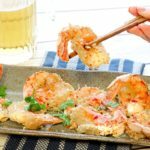 These Gluten-Free Baked Coconut Shrimp are a bit healthier than the fried version, but just as tasty. You’ll wish you made double batches of this appetizer, they will go quickly! Butterflying shrimp is not difficult. Make sure you take care not to cut all the way through. Leave the tails on for an easy grab. Get your dredging prep in order –> egg whites, Panko breadcrumbs, coconut flakes, and the flour mixture. 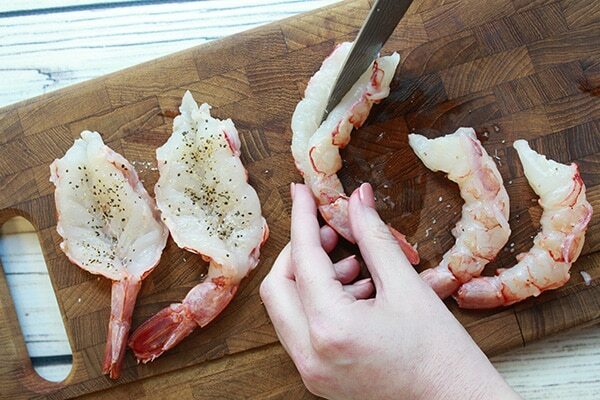 Dredge the butterflied shrimp in the crumb mixture and make sure to coat evenly on both sides. In the oven for only 10 minutes, watch for the shrimp to turn pink and curl. Look for that golden brown finish on the shrimp. 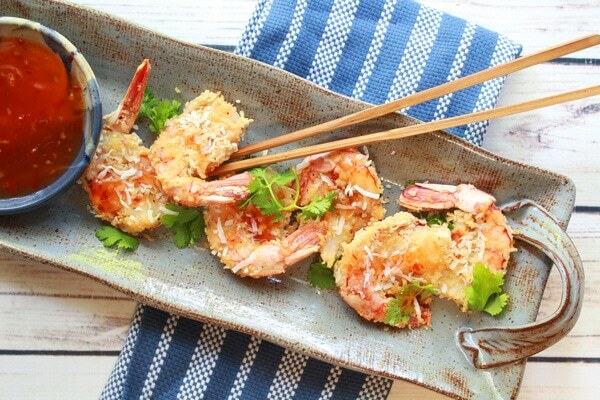 This Gluten-Free Baked Coconut Shrimp is a real crowd-pleaser! Sweet chili sauce makes the perfect dip for this delectable appetizer! 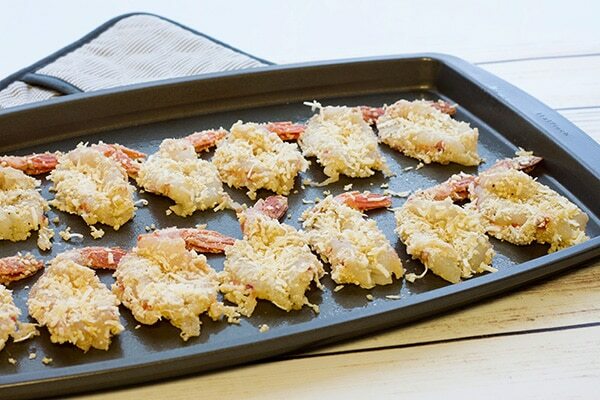 These easy Gluten-Free Coconut Shrimp are baked, not fried, and are the perfect appetizer for your upcoming holiday party! Spray a large cookie sheet with cooking spray. Preheat oven to 450 degrees. 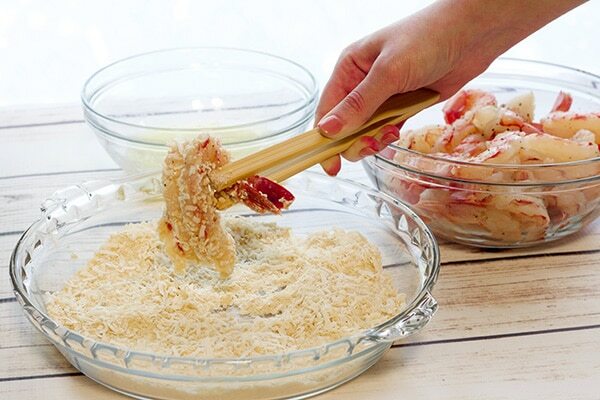 In a flat glass dredging dish, combine the Panko breadcrumbs, flour, and coconut flakes. In a small bowl beat the egg whites. Sprinkle the shrimp with the salt and pepper and coat each shrimp with the egg whites, then transfer to the crumbs mixture dredging and making sure the shrimp are evenly coated with the mixture. Place the shrimp in a single layer onto the cookie sheet. Spray the tops of the shrimp with the cooking spray and bake for 10 minutes, or until the shrimp are curled and golden brown. Garnish with the cilantro and serve with the sweet chili sauce. You can find gluten-free Panko breadcrumbs and flour at most major grocery stores. 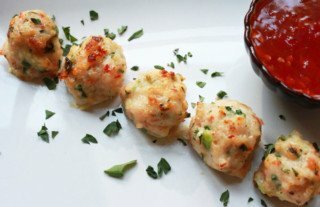 If you liked this recipe, try our Spicy Baked Shrimp Balls. These gluten-free coconut shrimp are a cinch to make and taste so damn good! Thanks, Toni! 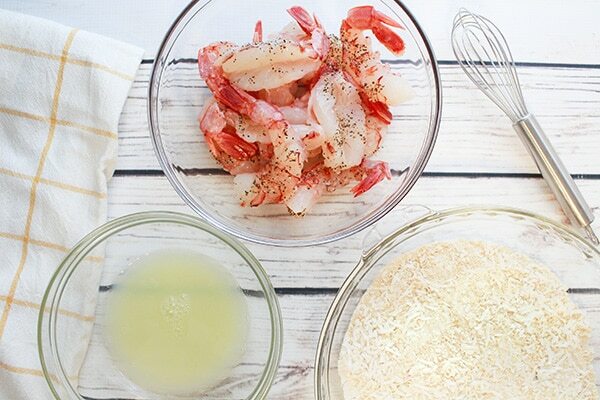 I adhere to a strict gluten-free diet and I am definitely going to make these shrimp! They look so good, and easy to make! Thanks for the recipe! You’re very welcome, Carrie! 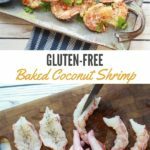 I know you’re going to love these gluten-free coconut shrimp! Great appetizer for a party too! 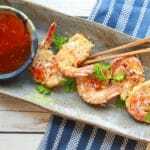 I love coconut shrimp and this looks far better for you than what you get in a resturaunt! Delicious! Can’t wait to try this recipe. Thanks, Shelby! They are very tasty gluten-free shrimp. Nice crunch from the GF Panko breadcrumbs! Glad you like it!